QNet, a leading direct selling company in association with Lions Club Bangalore, Kodigehalli marked Children’s Day by inaugurating a health camp at a Government Primary School in Sahakarnagar. 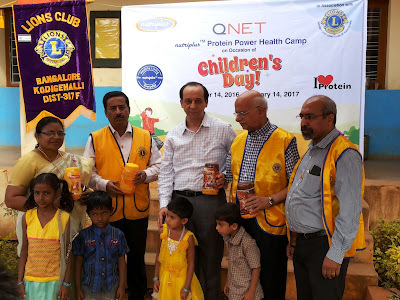 The two month long program called the Nutriplus Protein Power Health Camp and is aimed at providing nutritional support to the students of the school by serving them protein shakes every day for two months. QNet's Nutriplus Protein Power is developed by Dupont, the global leader in innovative soy-based technologies and ingredients is a good tasting, high quality, 100 percent vegetarian source of protein derived from soy. This product has an excellent combination of vitamins, minerals and trace elements in balanced proportion for utilising the protein optimally. 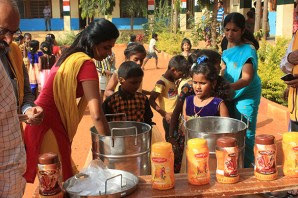 The children’s version which additionally contains Docosahexaenoic Acid (DHA), a polyunsaturated omega-3 fatty acid, considered to be a beneficial fat is being used at the Health Camp to provide the students aged 6 years and above with the necessary nutrition. Each of the 180 students will be served a protein shake every school day till January 14, 2017. The Nutriplus Protein Power Health Camp was inaugurated by Lion B Mohan district governor. Nishchal Churamani, Head – Corporate Communications for QNET in India said, “QNET’s aim is to help create awareness about health, wellness and nutrition through our products and services. During the research and development phase for our products, we realised that Protein Energy Malnutrition (PEM) is a major public health concern in India. As undernutrition is more common in the lower income group, we decided to do something about it by partnering with Lions Club.